Rewarding Times are delighted to team up with Bewleys Cafe, Grafton Street to bring you Brunch main course, tea or espresso based coffee of choice plus cocktail of your choice for 2 people for the special price of €40. 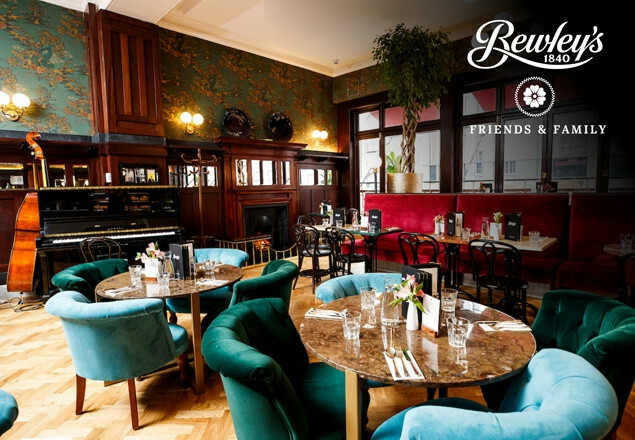 Weekends are all about spending time with friends and family, and the best place to do that is in the heart of Dublin at the Bewley’s Jazz Brunch. Throughout the years Bewley’s Grafton Street has always been a space where people have gathered and spent hours together, either reconnecting or meeting for the very first time. Bewley’s Jazz Brunch is the perfect opportunity to do just that. Delicious food, signature coffee and tea and live jazz in the beautiful, restored surrounds of the iconic Dublin landmark will be a brunch that people will want to make their weekend staple. Brunch fans will be pleased to see that the Bewley’s Jazz Brunch menu includes the favourite Bewley’s Breakfast as well as Brunch Classics that will truly delight the senses. The menu features, French Toast served with bacon and Highbank Orchards’ organic apple syrup and slices; Eggs Royal, Irish smoked salmon with poached eggs and a citrus hollandaise sauce; Poached Eggs & Avocado with rocket salad and Pecorino cheese on grilled sourdough and Granola Yoghurt Parfait, Irish natural yoghurt layered with fresh berries, berry compote, honey and organic granola. Brunch is served every Saturday, Sunday and Bank Holiday Monday from 10 to 4pm. Bewley’s Jazz Brunch Experience is available every Sunday & Bank Holiday Monday from 11am-4pm with live Jazz from 12.30 – 3pm. Bookings can be made by contacting events@bewleys.com in advance. Please quote your voucher number, Name, contact telephone number, preferred time and date of booking and the number of people in your party. Please note that bookings can be made from Mondays from 9am – Fridays at 4pm, excluding Bank Holidays. The tea or coffee included in this offer is from our tea menu which offers over 18 different types of tea and from our coffee menu which offers a range of espresso based coffees and freshly brewed filter coffees. Teas or coffees containing alcohol are not included. Offer is available to customers aged 18 years old and older.